I haphazardly packed the back of the truck in the cold, dark pre-dawn hours Saturday morning as the dogs looked on through the glass front door. I’m sure they were just as curious as I was about what possessed me to be up this early on a Saturday after only a few short hours’ sleep. Friday night I had been out with friends enjoying our annual Christmas Party and had stayed longer than I had planned. I had double-booked my weekend and needed to be in Sedona by sunrise to meet a new friend for a weekend of camping, hiking and gear testing. 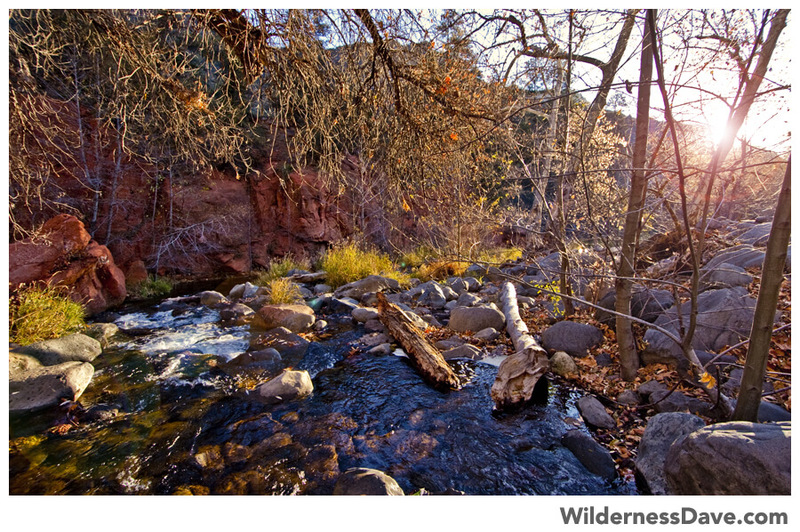 Tim had arrived in Sedona early Friday afternoon ahead of me and claimed our campsite at the tiny Manzanita Campground along Oak Creek. We had planned this trip on the spur of the moment realizing that we both were planning outings to field test new gear and figured it was the perfect opportunity to meet. After a few phone calls and a handful of emails back and forth, we had reservations for a campsite and a loose itinerary. I was in charge of figuring out our hike for Saturday since I am more familiar with the area. 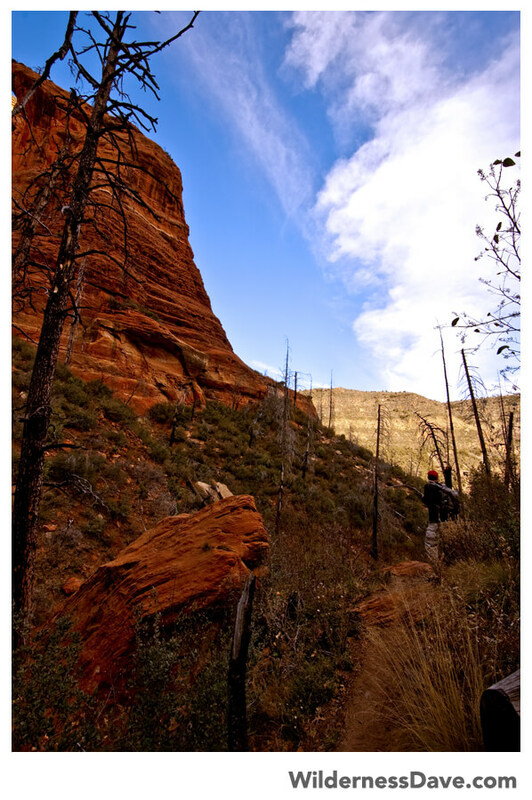 I noticed that there was a nice, strenuous hike very close to our camp that would take us to one of only a few natural rock arches around Sedona. 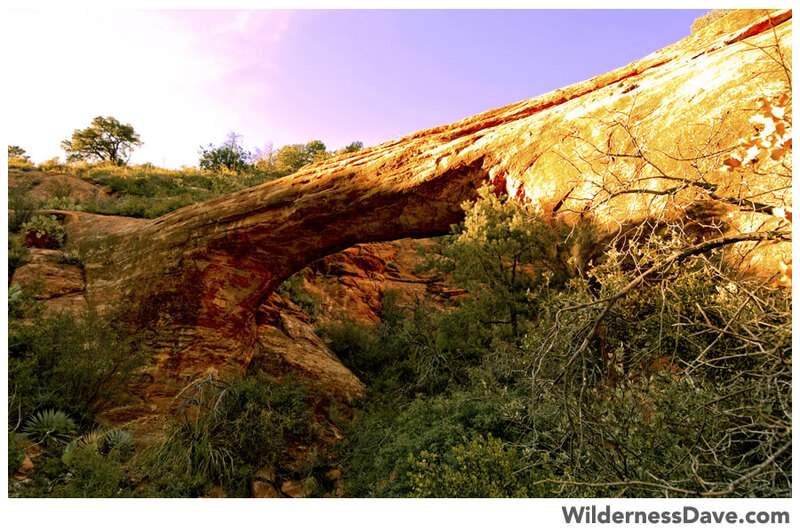 Vultee Arch is a small natural rock bridge named after the owner of a small aircraft manufacturing company. Jerry Vultee and his wife got caught flying in a severe blizzard over Wilson Mountain in 1938 and crashed on the north end of the plateau. Between the crash and the resulting fire, neither survived. Between last minute packing, a longer than expected stop for coffee and fuel as well as not accounting for the extra distance from the my new house, I was running late. I realized I wasn’t going to make it to camp before day break, but hoped I would at least make it to the lower end of Sedona’s Red Rocks by Sunrise. I barely made it to the turn-off as the sun was getting ready to crack the horizon. I stopped for a few pictures of first light and found a great old tree to use as foreground. I continued toward Sedona and made it as far as Bell Rock before I decided I needed to stop and capture more images of the sunrise. I managed to take some really nice shots at Bell Rock as the sun climbed higher. 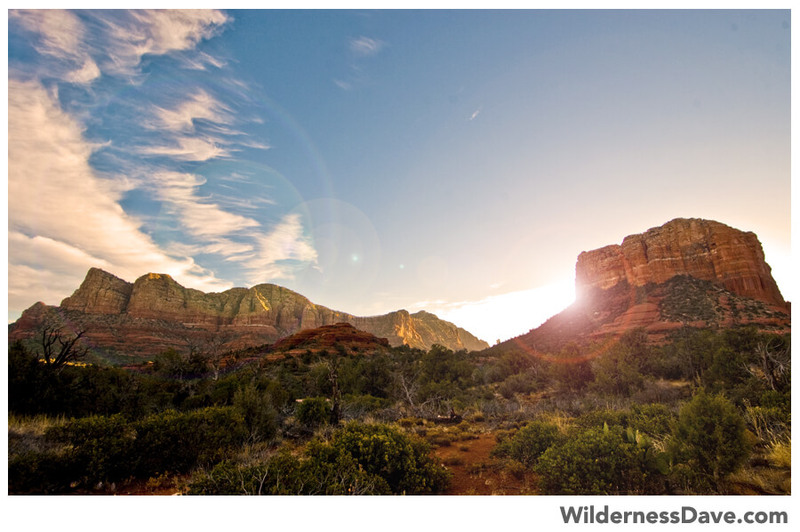 I decided to skip a stop in Sedona and head straight to camp, knowing I was running late. There was really no reason why I needed to be to camp so early except that I had specifically told Tim that I would be. That was enough reason for me to worry about being late. When I got to camp, Tim was up and had been down by the creek. After a handshake and an apology I unloaded my gear and set up camp as we visited like old friends. We spent the better part of the day talking about gear, the outdoors, family, food and life in general. Tim is one of a small handful of people I’ve now met in person after getting to know them through Social Media outlets like Facebook and Twitter. It’s the modern version of finally meeting a pen-pal you’ve written to for years. There is an instant familiarity, comfort and friendship that is merely extended by the shaking of a hand and the sharing of a meal…even more so when done around a camp fire. It eventually came time to head out for our hike, we needed to make it over Sterling Pass and down to the arch by 4:30 if we were going to have a chance at being in position by sunset at 5:15. I had studied the times and angles of the sun against the topography around the arch to insure that we wouldn’t lose the sun early due to some distant peak. It looked as through we’d have light at the arch until at least 5pm. We headed out at 2:30 to give us plenty of time to hike the pass and make it down in to canyon below the arch. I did not have an exact idea of how difficult the hike up to the arch itself would be so we needed a little padding in the schedule. The marked trailhead for Sterling Pass was almost directly across the street from camp where we began the steep climb up and over the rocky pass. 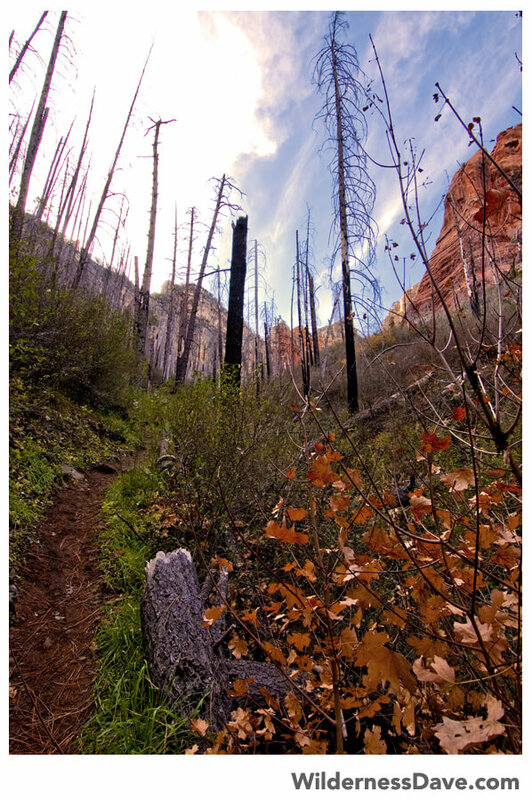 Much of the area was still recovering from the Arch Fire that devastated this canyon in 1996. The blackened skeletal remains of the formerly thick forest jabbed skyward through the lush new growth optimistically trying to regain it’s footing. The rock and vegetation changed at the pass before we plunged back down the steep switchbacks on the other side. The forest was much thicker on this side of the pass where it had clearly been protected from the fire. My knee was reminding me throughout the descent that it is still not 100% and I was relieved a bit when the trail leveled out finally along the bottom of the canyon. We were on the lookout for the side canyon containing Vultee Arch and, with the sun chasing toward the horizon, we were getting short on time. Finally we reached a point where we could see the arch, still drenched in the glow of the setting sun. As we approached the rock ledge that house the plaque describing the arch’s namesake, I noticed we were not going to have light on the arch for as long as I had estimated. This was going to significantly shorten the window for getting the photographs I was after. I was feeling the pinch of time and when we found what appeared to be the small trail leading to the actual arch, I took off leaving Tim to find his own pace. I aggressively scrambled through brush and cacti along the overgrown trail before finding the right spot to venture off-trail in an effort to find a unique angle for shooting Vultee Arch. I waded through thick Manzanita and danced around prickly pear cactus and agaves as I climbed under and around the arch. The sunset light was well worth the effort and I was glad that we’d made the decision to visit the arch when we did. 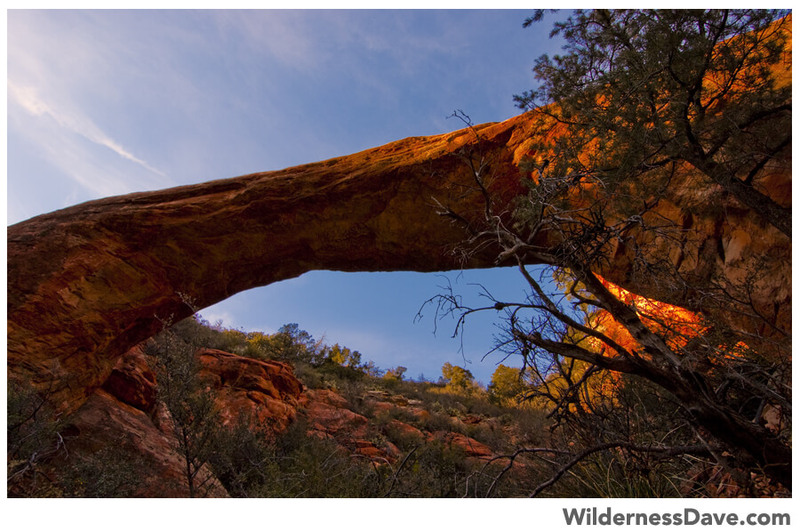 The sunset that evening gave us an amazingly warm orange glow that accentuated the red rock of the arch. 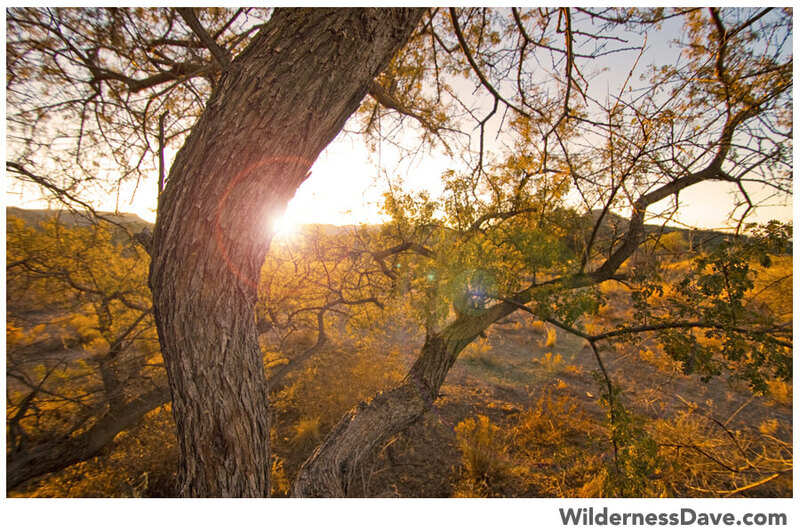 Even the vegetation took on a supernatural glow as the sun cast the last of it’s fading light across our little canyon. Tim caught up and found a perch atop the arch to watch the sunset and nibble on some trail mix as I scrambled precariously along all points collecting my shots. When light had faded from the arch we hiked back down to the rock vista, made hot coffee and watched the remainder of the sunset. Once darkness had pushed the last traces of light from the horizon we packed up and headed out. The cold was kept at bay with the exertion of climbing the switchbacks back up to Sterling Pass. As we crested the pass we were greeted with a rich, black, moonless desert sky deeply punctuated with brilliant stars. We sat here for a while, with headlamps off, taking in the night sky. Both of us live in larger cities where the night is never truly dark and stars never laid out so thick. Some time later we strolled back in to camp and started dinner. We ate well and talked late in to the night around the camp fire. This is the perfect example of what I love about being outdoors. We encountered very few people on the trail and all of them had bailed before light ran out. We had the arch entirely to ourselves and experienced it in a way that very few ever would. The desert was our playground and I reveled in it with a giddy, childlike joy. For more pictures from the hike check out Tim’s gallery here.